Chicken Chimichangas are straight up comfort food the whole family will love. Tortillas are layered with refried beans, seasoned shredded chicken and cheese, then they’re wrapped and fried for a perfectly crisp, oh so satisfying texture! Super classy recipe, I know. I’ve said this before, but I really don’t eat very “classy.” When I was trying to think of a food-related blog name (back when I started this blog) it seemed like all the good ones were taken so Cooking Classy was the best I could come up with. I know chimichangas aren’t exactly classy and they are super hard to make look pretty, but these chicken chimichangas taste amazing! And if there is one thing I know how to make, it’s a perfectly fried homemade chimichanga. Growing up, I lived on bean and cheese chimichangas (honestly, I don’t know if that would even be considered a chimichanga or just a fried bean and cheese burrito, but either way I’m hooked on those). My mom would make homemade chimichangas a lot because they were so quick and easy. 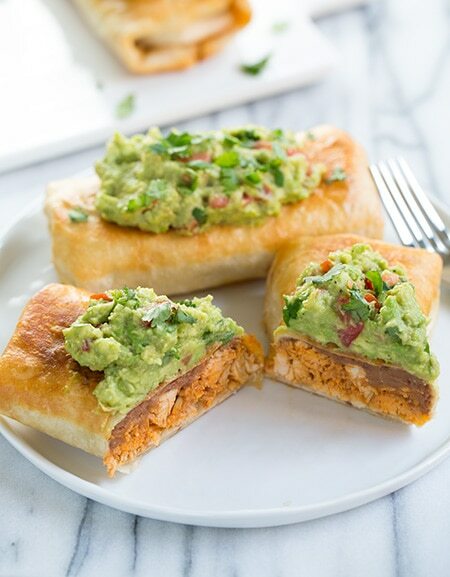 Chimichangas are a popular Tex-Mex dish that are made by filling a tortilla with meat, beans, cheese, and other ingredients and then rolling it up burrito-style and frying it. Chimichangas are especially popular in Arizona, and I highly recommend trying one if you ever find yourself in that part of the country! Saute onion and garlic until tender. Add tomato sauce, water, spices, and salsa to the same skillet and simmer until thickened. Stir in sour cream and chicken. Layer the tortillas with refried beans, chicken and cheese, then fold to form burrito. Fry chicken chimichangas in batches until golden brown. Serve immediately with guacamole and your favorite toppings. Can I Use Corn Tortillas Instead? I’m not sure how well corn tortillas would hold the chimichanga filling, or if they’d be big enough to even make a chicken chimichanga. If possible, I recommend using burrito-sized flour tortillas for this recipe. Can I Use Another Meat in This Recipe? Definitely! With this chimichanga recipe, I decided to use chicken but they’d also be really good with shredded beef (or another meat of your choice). 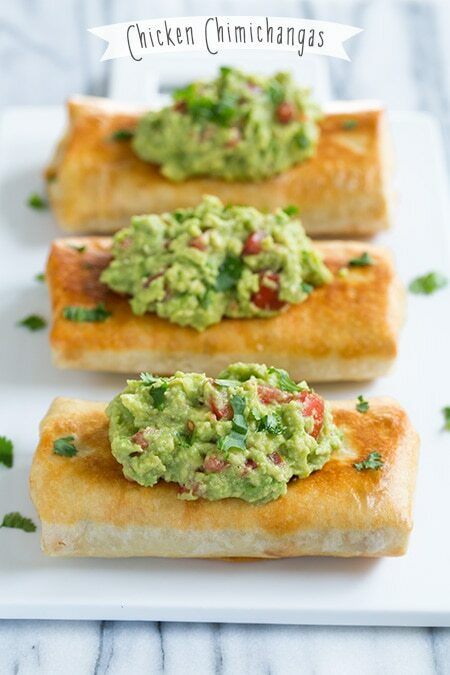 If you wanted to make these chimichangas a little healthier, you could brush them with butter or oil and bake them in the oven (at 400 degrees F for 10 – 12 minutes on each side until golden brown). Most of the time I use half extra virgin olive oil and half vegetable oil to fry chimichangas (just be careful the oil doesn’t get too hot and use a lower temp), so that’s another slightly healthier option. 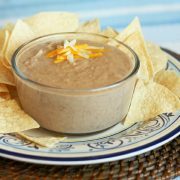 If you use store-bought refried beans in this recipe, you may want to add a tablespoon or so of water to thin them out a bit. These are straight up comfort food the whole family will love! Tortillas are layered with refried beans, seasoned shredded chicken and cheese then they're wrapped and fried for a perfectly crisp, oh so satisfying texture! Heat olive oil in a skillet over medium-high heat. Once hot add onion and saute until slightly golden and tender, about 4 minutes, adding in garlic during the last 30 seconds of sauteing. Add in tomato sauce, water, chili powder, cumin, paprika, coriander, salsa, and season with salt and pepper to taste. Bring just to a bubble, then reduce heat and simmer, stirring frequently until sauce has thickened and reduced by about half and onions are tender. Stir in sour cream and toss in chicken. 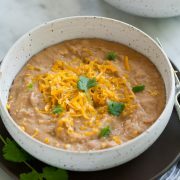 Spread 1/4 cup refried beans onto the center of each tortilla, leaving a 2-inch border on the edge of tortilla. 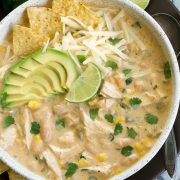 Layer with each with 1/2 cup of the chicken mixture and top with 3 Tbsp shredded cheese. Fold the 2-inch ends up and then fold one side over the top and roll. Fill a pot with 1/2-inch vegetable oil and heat over medium-high heat. Once oil is hot (about 350 degrees F on a deep fry thermometer), add filled tortillas (you should be able to fit 2 or 3 at a time so work in batches) and fry until golden brown on bottom then using metal tongs, carefully rotate to opposite side and cook until golden brown on opposite side. Remove and drain on paper towels. Serve warm topped with guacamole, diced tomatoes, cilantro, sour cream, salsa or hot sauce. *If using canned, I'd highly recommend stirring in a few tablespoons of water to thin them out. I used homemade but canned works fine too. **I just used half monterey jack and half cheddar, but a pre-shredded Mexican blend works fine too. janet: Can these be baked vs. fried? Kathryn George: Hi Jacklyn, we made these just before Christmas as a “to-go” while we walked the Christmas lights. Once again your recipe was a HIT. Our family has been “blessed” at the table by your website. From Lasagna, to Soups, to tacos and now Chimi’s your recipes are batting a 1000 at this house (lots of ball players here :)). Thanks for all the time you put into each post….Each recipe has accompanied me on the counter on the iPad and Cooking Classy is now my best friend in the kitchen.